Pebeo Vitrea 160 is part of a new generation of thermo-hardening, transparent, non-toxic, water-based paints specifically designed for use on glass. Vitrea 160 can be applied to glassware, vases, lamps, and even an entire window surface. The Vitrea 160 line includes frosted paints for an etched-glass look, and mediums that allow for reproduction of crackled, iridescent and frosted glass effects. In contrast with Pebeo Porcelaine 150, the Vitrea 160 colors offer more of a blown glass or fused glass look. Colors are runnier than Porcelaine 150, and they mix easily. Whereas Porcelaine 150 colors are solid, even single colors of Vitrea 160 often seem to have many swirling colors inside. Porcelaine 150 and Vitrea 160 heat set at different temperatures and are not intermixable. Pebeo recommends that you use a soft, natural fiber brush, such as a squirrel hair brush or a red sable watercolor brush, to apply Vitrea 160. A soft brush will have the right consistency for the paint, and is less likely to leave brush marks. Individual colors are packaged in 45 ml (1.5 oz) bottles. Vitrea 160 mediums and Vitrea 160 outliners are packaged in 20 ml (.68 oz) tubes. Vitrea 160 Paint Markers are also available, in a more limited range of colors. Note — Due to application, there may be variation in color between Vitrea 160 Paints and 160 Markers. Vitrea 160 Workbox Set — This innovative set comes in a plastic carrying case that opens into a fully functioning double-layer workbox. It contains 10 of the most popular Vitrea 160 glossy colors in 45 ml (1.5 oz) jars, as well as a Squirrel hair paintbrush, a mini-palette, a 20 ml tube of Pearl Relief outliner, a sponge, and a user guide. Colors included are Sun Yellow, Paprika, Pepper Red, Lazuli, Turquoise, Oriental Green, Amber Brown, Bengal Pink, Sandalwood Green, and Crimson. 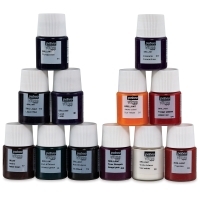 Vitrea 160, Set of 10 — This kit contains one each of 10 glossy colors in 45 ml (1.5 oz) bottles. Colors include Sun Yellow, Paprika, Pepper Red, Lazuli, Turquoise, Sandalwood Green, Emerald, Earth Brown, Veil White, and Ink Black. Frosted Medium — Frosted Medium can be used to create an infinite variety of light and shadow effects. Use it alone to create a frosted or etched effect — or mix it with gloss colors to lighten them and make them appear frosted, all without changing the colors’ technical characteristics. 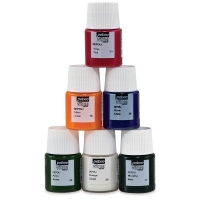 Vitrea 160, Set of 12 Glossy Colors — This set contains 12 glossy colors in 20 ml (0.68 oz) bottles. The colors include Sun Yellow, Paprika, Pepper Red, Bengal Pink, Amaranthine, Lazuli, Lacquer Blue, Turquoise, Oriental Green, Amber Brown, Ink Black, and Veil White. Vitrea 160, Set of 6 Frosted Colors — This set contains 20 ml (0.68 oz) bottles of Cloud, Lemon, Aniseed, Azure, Mint, and Pink. 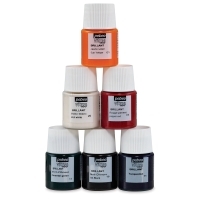 Vitrea 160, Set of 6 Glossy Colors — This set contains 20 ml (0.68 oz) bottles of Veil White, Ink Black, Pepper Red, Sun Yellow, Oriental Green, and Turquoise. Thinner — Use this medium to thin Vitrea 160 colors without lessening their durability. Gloss Medium — Used to lighten Vitrea 160 colors and to add gloss effects without changing the colors’ technical characteristics, Gloss Medium can be used to create an infinite variety of light and shadow effects. When used on its own, it is almost invisible after application, ideal for making inclusions. Iridescent Medium — When mixed with Vitrea 160 colors, Iridescent Medium produces iridescent colors that glimmer and change colors when the light hits them. Once dried and baked for 40 minutes at 325°F (163°C), the paints are permanent and dishwasher safe. Avoid use of strong, abrasive cleaners such as steel scouring pads, and sharp cutting implements such as stainless steel knives, which may leave scratches on the surface and make it more difficult to clean. To heat set a finished piece, place it in a 325°F (163°C) oven for 40 minutes. Since many vitreous and ceramic materials cannot withstand sudden changes in temperature, we recommend that you place your piece in a room temperature oven and allow it to warm up with the oven. After 40 minutes, turn the oven off and allow it to cool back to room temperature gradually. Not recommended for use on surfaces that come in contact with food. Pebeo Vitrea 160 is a waterbased, non-toxic paint developed to mimic the look of stained glass, blown glass and fused glass without the dangers of working with those materials. All you need to make the paint permanent is a household oven. 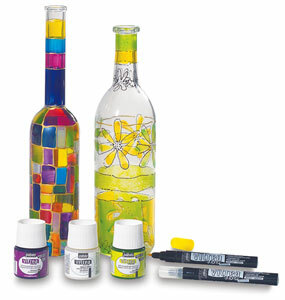 This colorful glass paint is offered in 20 transparent colors and 10 frosted colors. Watch this demo showing various techniques using Pebeo Vitrea paint and dimensional outliners.